This data set provides measured and calculated variables describing the carbon pools in river waters, CO2 respired from the water and total amount of CO2 evaded, dissolved oxygen isotopes (delta 18O-O2), and concentration of bacterial cells in river water. Samples were collected from 10 white-water rivers, two clear-water streams (one each in Amazonas and Acre), and two black-water rivers in Amazonas from July to September 2005, which coincided with a severe drought in the western and southern regions of the Amazon Basin (Zeng et al. 2008). Eight of these sites were resampled during August through September 2006 of the following year (no drought). Figure 1. Map of study sites within the Amazon River Basin. Major tributaries are in grey. The circled sites are located in the state of Acre, whereas the others are in the state of Amazonas (Ellis et al., 2012). The investigators were Richey, Jeffrey E.; Victoria, Reynaldo Luiz; Souza, Reginaldo; Aalto, Rolf Erhart; Abdo, Mara Silvia Aguiar; Alin, Simone Rebecca; Aufdenkampe, Anthony K.; Ballester, Maria Victoria Ramos; Barbosa, Roosevelt Passos; Bernardes, Marcelo Correa; Bezerra de Barros Lima, Roberta ; Bolson, Marcos Alexandre; Bolson, Marcos Alexandre; Bonelle, Nilton; Brito, David Silva; Cabianchi, Giovana; Cogo, Michelle Cristine; da Silva, Luis Vilmar Souza; Dalmagro, Higo Jose; de Oliveira, Carolina Barisson Marques; Deus, Fabiano Alves de ; Devol, Allan H.; do Nascimento, Clive Reis; Ellis, Erin Elizabeth; Ferro, Jaderson Coradi; Filho, Walter Jorge do Nascimento; Frickmann, Fernando Cruz ; Gamero Guandique, Manuel Enrique; Gomes, Beatriz M.; Gomes, Viviane; Gouveia Neto, Sergio Candido; Hanada, Lais de Carvalho; Holtgrieve, Gordon William; Kelly Batalha Silva, Roberta ; Krusche, Alex ; Kurzatkowski, Dariusz ; Lacerda, Francisco A. Siebra; Leite, Nei Logsdon, Miles Grant; Macedo, Gelson de; Marcondes, Renata; Marilheuza, Campos Paro; McGeoch, Lauren; Melo, Emanuele Gurgel de Freitas; Mendes, Francisco de Assis; Moreira, Marcelo Zacharias; Munhoz, Kelli; Neu, Vania; Ometto, Jean Pierre; Pimentel, Tania Pena; Priante Filho, Nicolau Rabelo, Claudenir Silva; Rasera, Maria de Fatima Fernandes Lamy; Remington, Sonya Marie; Rodda, Sarah; Ruiz Mateus, Neuza Maria; Salimon, Cleber; Santiago, Alailson Venceslau; Santos, Arnoldo Marcilio dos; Silva, Cleoni Virginio da; Silva, Jonismar; Silva, Simao Correa da; Sousa, Eliete; Souzapetro, Petronio Lopes de; Toledo, Andre Marcondes Andrade; Tumang, Cristiane Azevedo; Umetsu, Cristiane Akemi Victoria, Daniel de Castro and Xavier, Farley de Oliveira. You may contact Ellis, Erin Elizabeth (ellise@u.washington.edu). 37 delta_13C_CPOC per mil delta 13C of the dissolved coarse particulate organic carbon component reported in per mil relative to the PDB standard. The purpose of this work was to understand the factors that control the range of water-column respiration rates observed in rivers and streams across the Amazon Basin. Accordingly, the investigators sampled rivers with a range of water chemistry types and respiration rates to determine how in situ concentrations of various parameters affected respiration rates. They then performed a series of statistical analyses, including partial correlation, step-wise backward multiple linear regression, and standard linear regression. To be considered a candidate for the multiple linear regression, input variables were excluded if they were highly correlated with each other (i.e. had a value of r that exceeded 0.7), or if there was more than one missing datum per variable. Much of the details on the derivitization of the data is reported in the methods section below and users are encouraged to view Ellis et al., (2012), for full details. Many parameters were processed minimally post field collection. DIC concentration: 1 percent of DIC value. Samples were collected during 2005 and 2006 in the Brazilian states of Acre and Amazonas, which are located in southwestern and central Amazonia. Locations were chosen to represent a range of water types and conditions found in these regions. 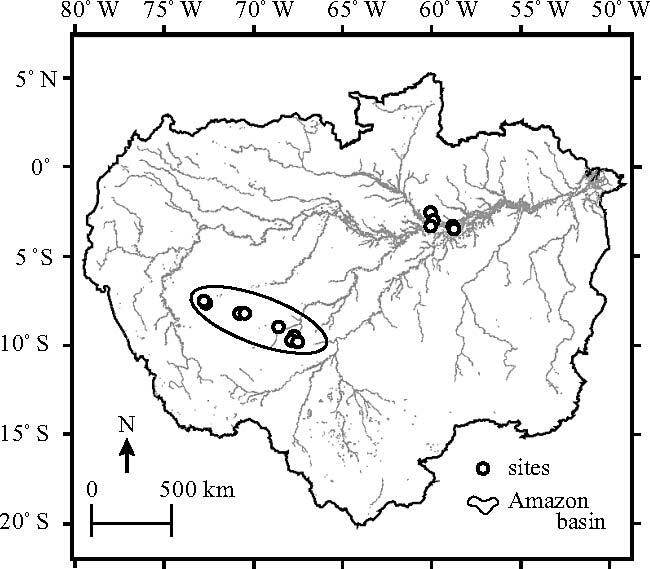 Due to the predominance of white-water Rivers in both Amazonas and Acre and the logistical challenges of reaching a variety of river types in this large region, investigators sampled 10 white-water rivers of varying sizes. They also sampled two clear-water streams (one each in Amazonas and Acre), and two black-water rivers in Amazonas. Watershed areas ranged from less than 10 km2 to 2,910,510 km2, which were calculated as in Mayorga et al. (2005). Not all sites were in the same stage of the hydrograph at the time of sampling. All rivers in Acre were in the low water stage, whereas rivers draining Amazonas were in the falling-water stage. Investigators collected samples from 14 sites from July to September 2005, which coincided with a severe drought in the western and southern regions of the Amazon Basin (Zeng et al. 2008). Eight of these sites were resampled during August through September 2006 of the following year (no drought). Water samples were collected from the thalweg of rivers using a submersible pump placed at six-tenths of the total river depth. Field probes (Thermo Orion 290 A+ pH meter, a Chek Mite CD-30 conductivity meter, and a 55 YSI dissolved oxygen probe) were immersed in a continuously overflowing graduated cylinder for ph, conductivity, and dissolved oxygen concentration determinations. Samples from small streams were collected directly below the water surface to minimize disturbance. PCO2 was analyzed via headspace equilibration following the methods of Cole et al. (1994) and modified as in Alin et al. (2010). PCO2 samples were either measured immediately using infra-red gas analysis via a Li-Cor LI-820 (Alin et al. 2010) or stored in glass bottles until analysis with a Shimadzu gas chromatograph (GC-17A equipped with flame ionization and electron capture detectors and a methanizer). Bulk size fractions of coarse particulate organic carbon (CPOC [greater than 63 um], FPOC [0.7 to 63 um], and DOC [less than 0.7 um]) were filtered in the field, whereas size fractionation of DOC was processed in the laboratory. Coarse suspended sediment (CSS) concentrations were measured by first passing a known volume of river water through a 63-um sieve, and then later drying and weighing the sieved material. CSS concentrations were multiplied by percent by weight C to determine CPOC concentrations. The material collected from a plankton net was preserved with HgCl2 for later analyses of weight percentages (percent by weight) of C, N, and delta 13Cof CPOC. Sieved river water was homogenized with a churn splitter (Wilde and Radtke 2003) and then filtered, providing the fine suspended sediment concentration (FSS) by mass difference (Aufdenkampe et al. 2001). Sieved water was also passed through precombusted glass fiber filters (GF/F), which were then analyzed for d13C, percent by weight of C and N, and FPOC concentrations. low molecular weight (LMW; less than 5 kDa) DOC, using a method modified from Burdige and Gardner (1998). Water was filtered through two GF/F filters in the field, placed on ice in the dark, transported back to the laboratory, and refrigerated until analyzed (within 48 h). Fifteen milliliters of sample were then centrifuged for 40 min. To calculate the percentage of DOC that was less than size X, we used the following equation (see Ellis et al., 2012). To determine the concentration of DOC (less than 5 kDa or less than 100 kDa) the unfiltered DOC concentration was multiplied by the percentage of DOC in the given size category. The concentration of the size fractions of DOC was obtained by subtracting the appropriate value(s) from the original DOC concentration. DOC concentrations were measured after acidification and sparging with high-temperature combustion using a Shimadzu TOC500A carbon analyzer (2005 samples) and a Shimadzu TOC-V CPH carbon and nitrogen analyzer (2006 samples). Those samples with high DIC concentrations were acidified and sparged for an additional 20 min to ensure DIC removal. Stable isotopes (13:12C) of carbon were measured in both the inorganic and organic size fractions to aid in partitioning among end-member sources. Results are given in delta notation with units of per mil, and were normalized relative to Vienna Peedee Belemnite. After drying coarse and fine materials in a 60 degree C oven, the samples were analyzed for delta 13C and C:N ratios using a Finnigan Delta Plus mass spectrometer coupled to a Fissions EA 1110 CHN analyzer with a precision of 0.3 per mil for the mass spectrometer. For 2005 samples, the C:N ratio was obtained directly from a model 440 CHN analyzer made by Exeter Analytical. The delta 13C of DOC was analyzed using an automated method in which DIC was sparged from the sample after adding phosphoric acid, followed by sodium persulfate oxidation of DOC to CO2. The CO2 gas was carried to an infra-red gas analyzer and then to a PDZ Europa-Hydra 20-20 isotope ratio mass spectrometer. Only the 2006 samples were analyzed. DIC field collections and isotopic measurements (delta 13C of DIC) were conducted as in Quay et al. (1992), with a precision of 0.03 per mil for the 2006 samples. DIC concentrations were calculated from pH and PCO2 for the 2005 samples. We used temperature-dependent equilibrium constant values (K1, K2, and KH) as reported in Clark and Fritz (1997). To estimate the delta 13C of phytoplankton, we used an isotopic fractionation factor of 12 to 17 per mil between the delta 13C of H2CO3 (calculated from the delta 13C of DIC [as in Mayorga 2004, using the equilibrium fractionation factors from Zhang et al., 1995]) and phytoplankton. This fractionation factor is derived from the relationship between H2CO3 and POM (predominantly phytoplankton) in the surface ocean (Goericke and Fry 1994). PCO2_atm and PCO2_s are the partial pressures of CO2 in the atmosphere and solution, respectively. kCO2 was determined as a function of wind speed (Alin et al. 2010). A value of k600, the gas transfer velocity for freshwater at 20°C, was selected for each wind speed based on the relationship between k600 and u10 values presented in Alin et al. (2010). Monte Carlo error-propagation techniques were used to determine the error of our calculated gas evasion flux. Respiration rates were calculated at all sites by measuring the consumption of oxygen over a 24-h period. Five initial and final replicate samples were incubated in 60-mL acid-washed Biological Oxygen Demand bottles in the dark in river water held at ambient temperatures. Bottles were agitated twice daily by gently inverting them several times to reduce aggregate formation. Oxygen concentrations were measured by Winkler Titrations (Wetzel and Likens 1991) using a Hach titrator. Dissolved oxygen consumption was determined as the rate of change between the initial and final replicates over the incubation period. The depth-integrated respiration rate for a given site was calculated from the respiration rate (i.e. measurements of oxygen consumption (in umols L-1 h-1). This rate was converted to CO2 production by using a respiratory coefficient of 1. It was then multiplied by the depth of the river to yield a depth-integrated respiration rate in terms of umols CO2 m-2 s-1. The error was determined using Monte Carlo error propagation techniques. Bacterial abundance measurements were made by epifluorescence microscopy using 4,6-diamidino-2-phenylindole(DAPI) optical filters in 2006. Forty-milliliter samples were collected, preserved with formaldehyde to a final concentration of 2%, and analyzed within 2 to 4 months of collection. A surfactant (0.5% solution of Triton X-100 in distilled water) was added drop-wise to particle-rich samples, which were then sonicated for 10 min. Next, the sample solution was stained with Acridine Orange for 3 min. Samples were then filtered using 0.22 µm black polycarbonate-membrane filters, and stained with DAPI for 10 min. Because these samples had high sediment concentrations, this dual-stain technique was necessary to illuminate the bacterial cells against the particle-rich background for counting purposes (Schmidt et al. 1998). Between 250 mL and 5 mL of sample were used, such that 200 cells were counted in 20 fields. Stable isotopes of oxygen dissolved in water delta 18O-O2) were measured to assess the origin of O2 (Holtgrieve et al. 2010). Samples were analyzed within 3 months using a Finnigan Delta XL continuous-flow mass spectrometer (Thermo Electron Corp). Masses 32, 34, and 40 (16O : 16O, 18O : 16O, and 40Ar) were simultaneously measured (Barth et al., 2004; Holtgrieve et al., 2010). Water isotopes (delta 18O-H2O), which came from a separate sample of river water, were analyzed on a Micromass Isoprime mass spectrometer. Results are given relative to Standard Mean Ocean Water in delta notation with units of per mil. Clark., and P. Fritz. 1997. Environmental isotopes in hydrogeology. Lewis. Wetzel, R.G., AND G.E. Likens. 1991. Limnological analyses, 2nd ed. Springer-Verlag. Wilde F.D. and D.B. Radtke. 2003. National field manual for the collection of water-quality data, U.S. Geological Survey.